Having planned well in advance, I took the overnight train and reached Kathgodam station at 5 AM to find the taxi driver waiting for me as promised. The drive up was under 3 hours, although the road for the last kilometre or so was quite broken. Reaching the place was amazingly energizing. Spread across a sloping hillside was a large organic farm, in the middle of which stood the large and very European looking log house chosen for this Himalayan Writing Retreat (they have multiple locations). Away from the madness of the city, it was an ideal place where I could shut out the outer world and listen to my inner writer. All the rooms had a pleasant smell of timber, were cosy and had attached baths. The small group of attendees - they limit participation to 10 - made it particularly intimate. We would all eat the home-cooked meals together, and having the cook always at hand for tea or coffee was ideal. Although the pressure cooker going off in the middle of a session was unnerving on day one - that stopped after the first day. The lounge area where the sessions were held was bathed in sunlight and on a clear day its wide glass windows offered panoramic views of the valley, hills and the snow peaks beyond. At night we could browse through the books in the house, including style guides and some of the books written by the hosts themselves. Or we would sit on the garden benches, think aloud and share stories with other participants. The fire and the moonlight made a perfect setting for that after-dinner coffee. Walking at sunset. Wait - shouldn't you be walking into it? 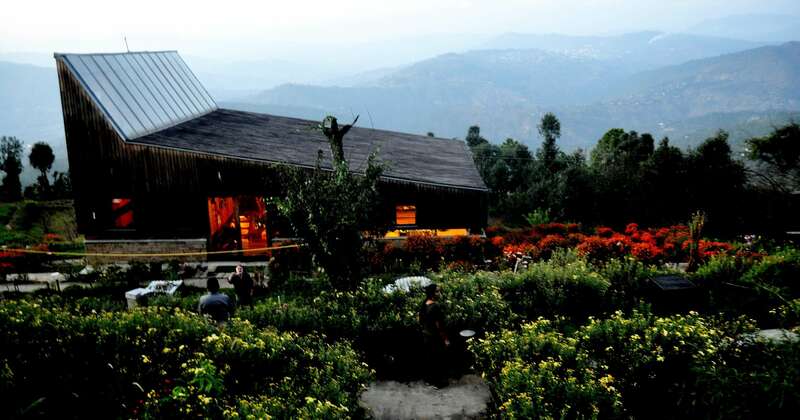 The retreat was in the village of Satoli - home to myriad bird species that chirp all day long. The walking trails were lined with pine and oak trees and led to vantage points offering serene views. There was a creek half an hour's walk from the farm where we could soak our bare feet while enjoying the sun setting beyond the hills, with no sound other than the hornbill. The lower reaches of a local forest reserve are just a twenty minute drive and Chetan took us there in his SUV. One of the participants, Matthew, who stays not far from the venue claims that he often goes there to meditate. He also claims that he saw a wild boar a stone’s throw away from his meditation spot, although the boar vanished into the thick woods on sighting him. The forest is also meant to be home to leopards, although we never got to see one. Our hosts were Chetan and Vandita, both published authors and permanent residents of these mountains. Here they write and teach and live a life most of us just dream of. Chetan, besides being the author of a critically acclaimed book, Bad Boys of Bokaro Jail, is also an accomplished public speaker and is very familiar with the local area and the Indian Himalayas in general. They were ably assisted by Roy Abraham, an adman from Mumbai, who recently directed a Raymond ad campaign. Roy was always ready with anecdotes at the fireside sessions after the evening jungle walks. The best part of the retreat was the gatherings around the bonfire. Those like me who were keen to, brought their own drinks. The evening discussions weren’t always literary. Some participants talked about their book plans interspersed with Matthew's anecdotes that he gathered on his solo motorcycle trip across Canada. Jenn chipped in with her share of experiences from her travel across 20+ countries. On the last day Jaya broke into an impromptu song and on Chetan's prodding I clicked her with full moon in the backdrop. The bonhomie and vacation experience was all wrapped around the writing sessions which were the core of the trip. The team of facilitators had obviously worked hard to prepare the contents of the retreat. Writing being a craft can be learnt with practice but don't expect any miracle in three days - it requires sheer hard work and discipline - but this was a great starting point for me. Intent and Discipline comes from within and if you have those, are ready to put in the hours, the team at the HWR are there to guide you. They have the necessary experience and know the ins and outs of the publishing world. They will answer your queries, tell you about the books you need to read, keep in touch with you even after you are done with the retreat and guide you in all possible ways. All the participants left the retreat with a concrete plan of how and when they will complete their books. Many continue to share their writings and snippets with the group even now - well after we have left. The interaction continued virtually because after those three days together we felt like friends and fellow himalayan writers. I have started work on my magnum opus, but even if I don’t write that book, I will still remember and cherish the experience I had at the Himalayan Writing Retreat.